We wanted to give you a heads up on the changes that are coming at Swift Industries! Many of our customers have customized bags over the years and hope to return to match their next purchases to bags they already adventure with. That’s why we’re letting you know that changes are in the works! Color is Swift Industries’ signature! It’s what makes our work distinctively yours. Never fear, we are moving forward with new ways to configure your custom colors and we’ll still give you hundreds of combinations to choose from! 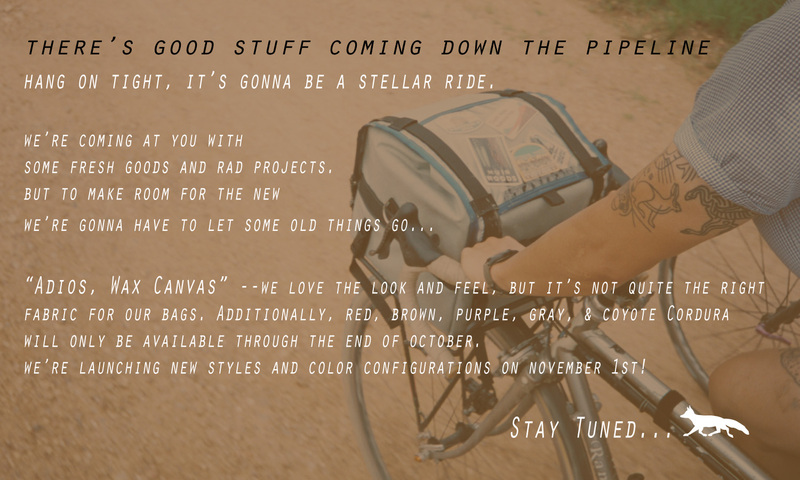 Starting on November 1st, you can expect the thread and trim to be black-on-black across the board, and we’ll be phasing out red, brown, purple, grey, and coyote Cordura colors. If you love love love current the colors and trim selection or want to match new purchases to your existing bags, now’s the time to place your orders! Wax Canvas is the only textile we are discontinuing right away. We love the look and the feel of this heritage fabric, but it’s not well suited for our baggage. ← What’s in our bags?